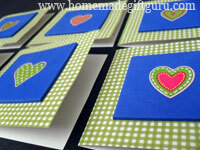 Here's a few easy ideas for creative homemade Valentine's Day cards. These Valentine's Day ideas are cute and simple! Make one for someone special... or make several for friends and classmates. These ideas are great for kids as well as playful adults. You can get little toy mazes at the dollar store in the party favor section or at party supply stores. Glue one to the front of your card and inside you can write "You are a-MAZE-ing!" Alternatively, you can print out a small maze on paper and glue that to the front of the card. You can also make one yourself using a heart for the borders. Candy Cains often go on clearance after Christmas. That's what inspired me to make these candy cane heart cards. Start by putting two candy canes together to form a heart. Use heavy card stock to create a card blank that is large enough to accommodate the size of the candy cane heart. Cut a slightly smaller piece of card stock to mat on the front of the card. This looks good and adds even more sturdiness. Hot glue or tape the heart to the front of the card. Write something inside like "You have a SWEET heart" or "Be my SWEET heart?" These days, there are lots of sizes, colors and flavors of candy canes to choose from, so you can customize your cards however you choose. I LOVE googly eye homemade Valentine's Day card ideas! You can get googly eyes at dollar stores and craft stores. These days, there's a variety of sizes, colors and styles to choose from. "EYE want you to be my Valentine"
"Valentine... I've got my EYE on you"
You can also glue googly eyes randomly or draw a character of some kind with googly eyes and write "I only have eyes for you!" "You and EYE are meant to be"
Another cute idea is to use old puzzle pieces to make a cute card. Start by finding two puzzle pieces that connect to each other. Make a card blank from card stock. Decide whether you like the front of the puzzle pieces as is or perhapse you may like to glue them upside down, showing the plane brown backing or you can choose to paint them to match your card's color scheme. Next, glue the two puzzle pieces to the front of a card. If you don't have any old puzzle pieces, you can trace a couple onto the front of the card. Write inside "We fit together"
You can arrange several puzzle pieces and write "Love you to pieces"
Or glue one single puzzle piece to the front of a heart themed card and write "You've got a piece of my heart" or "You'll always have a piece of my heart"
This idea is simple and super sweet. Make a card and put a thumb print on the front. Write inside "Thumb-body loves you!" You can make a sewn heart using a sewing machine or simply sewing by hand. If you have a sewing machine and you know how to use it, simply sew a heart onto a piece of card stock. Otherwise, to sew a heart by hand... take a piece of card stock cut slightly smaller than your card and make several evenly spaced holes in the shape of a heart. I like to use a large safety pin to do this but you can make them whatever size you need. Use the holes to hand "sew" raffia, string or craft cord, creating a sewn heart. 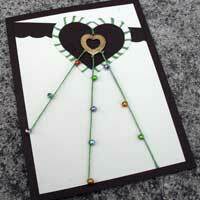 Glue the sewn heart embellishment to the front of your card. Inside write "I love you SEW much!" or "You make me SEW happy"
You can make several fun 3D homemade Valentine's using a sheet of Valentine stickers or a single cute stamp. In this easiest homemade Valentine tutorial, I show you my super simple formula for the easiest Valentines ever. It takes about 10 minutes to make enough for the whole class! I hope you like these homemade Valentine's Day card ideas! You never know what might inspire your next card. The ideas on this page were largely inspired by simple love puns. You may also like these heart-themed cards. They were inspired by bead-making supplies. They are a blast to make for elegant occasions! Make a FUN Valentine Countdown for Your Favorite Lil' Person!